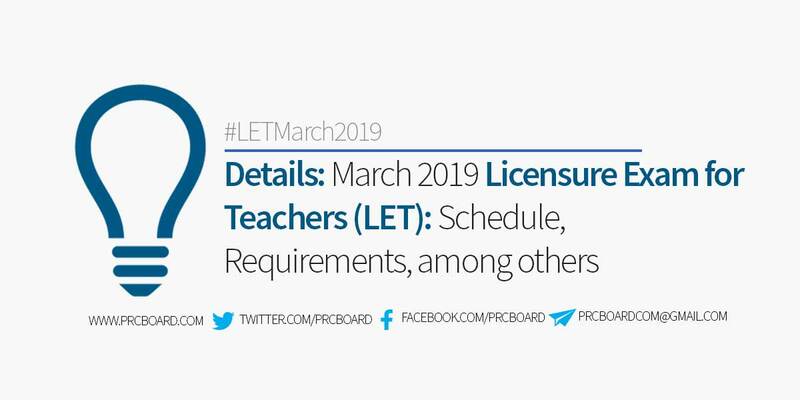 Manila, Philippines - The Professional Regulation Commission (PRC) announced the schedule of application, deadline of filing as well as requirements for application in March 2019 Licensure Examination for Teachers (LET) - Elementary and Secondary levels. The board exams for teachers will be held on Sunday, March 24, 2019 at designated testing locations in Manila and all Regional Offices nationwide. Below is the detailed schedule for March 2019 LET as per recently-released PRC Schedule of Licensure Examination for the Year 2019. UPDATE 1/10/19: PRC likewise announced that March 2019 LET applicants can directly proceed to Philippine International Convention Center (PICC) and at PRC Service Centers in Robinsons Place Las Piñas and Novaliches for their appointment schedules. LET applicants are reminded to download and fill out the application form and bring two (2) pieces of passport size photos in white background and complete name tag. Meanwhile, for applicants who have generated an online appointment are advised to proceed in their appointment date and place. PRC also extended the filing of applications from January 25, 2019 to February 8, 2019. The most recent LET was held on September 30, 2018 at designated Regional Testing centers in the country. The exact number of examinees and passers for both elementary and secondary will be posted here soon as released by the Board of Professional Teachers. During March 2018 LET, 13,774 elementary teachers out of 58,323 examinees (23.62%) and 22,936 secondary teachers out of 76,673 examinees (29.91%) successfully passed. Kier Araula Baugbog from Pamantasan ng Lungsod ng Valenzuela ranked first in the secondary level exams garnering 92.40% while John Michael Tagayon Dela Paz from UP Diliman got the top spot in elementary level having 88.80% rating. Hi I just wanna ask, I will going to pay for my transaction fee at PRC Robinsons Manila and it is the same date I have to file for it. Meaning In just 1 day I will be processing my payment and application for Let. My question is, When can I print my profile information? Is it on the day before paying the transaction or after? I am just a little bit confused. Thank you! After paying you can able to print it..
Di po ako maka register .nagbabalik balik sa third step. Paulit ulit na po. Di po ba pweding mag direct ang mga PWD ? Hindi po kami mkapag online.bakit po??? im planning po na mag walk in nalang pero anu po yung need e download and fill out the application form, may available po ba nito sa mismong office. ask ko lang po im planning po na mag walk in nalang kasi ang bagal po ng system madalas error, anu po yung need na files to download may available poba nito sa office? salmat po. Ganun rin po me hindi mkapag register bakit po? Pwede po mag ask kailangan pa poba ng valid sa pag file ng let? Create an Account at https://online.prc.gov.ph/. Prepare a scanned passport size picture. You’ll be asked for a profile picture while creating your account. Log in to see your Profile. Make sure all your details are correct, or else you can click “Edit” on the top right of your profile. Make an appointment by clicking “Select Transaction”. Then select “Professional Teacher” as the Profession. If you are a first timer, do not put anything on the “Application Number (from NOA)" field, just click “Proceed”. Select your preferred PRC Regional Office (ex. PRC Davao). Your appointment details will appear. There is a pre-selected/scheduled date and time already. If you cannot go to PRC on that date, you can “Reschedule” it only ONCE. After choosing your final Appointment Date, click “Proceed”. Choose your payment option. On December 16, 2018, when I made my appointment, there were only 2 options posted: via Land Bank or PRC-Cashier. I chose the latter. Next, you will see your PRC Payment Reference Number. Screenshot it, edit, and print. If in case you failed to print it the first time you made the appointment, you can always go to the left side of your Profile, and click “Existing Transaction”, then “Payment”, then your Reference Number should be there. Is there need po ba magrefresher course if 11 years kanang graduate sa BEED pero hindi ka nakakuha ng examination? When will be the next schedule of LICENSURE EXAMINATION FOR TEACHERS 2019?